In 2016, Hanoi National University of Education deployed QUALITY ASSESSMENT STANDARDS FOR HIGHER EDUCATION PROGRAMS (Decision No. 65/2007 / QD-BGDDT dated 01/11/2007 of the Minister of Education and Training Ministry), including 10 categories and 61 criteria based on the guidance of the Ministry of Education and Training in Official Dispatch No. 462 / KTKDCLGD-KDNHH dated 09/05/2013 and the Official Dispatch No. 1237 / KTKDCLGD-KĐHH dated 03/8/2016 of the Department of Educational Testing and Accreditation, Ministry of Education and Training. The purpose of the self-assessment is to review all school activities for the five years from 2012 to 2016 and identify strengths, points and follow-up plan. The plan will maintain and promote strength and overcome weaknesses to continuously improve the quality of the university. After nearly one year of implementation, the university has completed its self-assessment report to the Council of self-assessment. After the school self-assessment committee evaluated, they sent it to the Department of Educational Quality Control and Testing and registered to the Center of Higher Education Assessment. On 25/5/2017, the External Assessment Committee of Vietnam National University signed an evaluation contract with our University. On 10/6/2017, Hanoi National University of Education held the opening ceremony of the official assessment (from 10/06 to 14/06/2017). During this time, our school well coordinated with the External Assessment Committee. On June 14, 1977, the university held a closing ceremony. The external assessment team gave some general evaluation and recommendations of quality improvement. 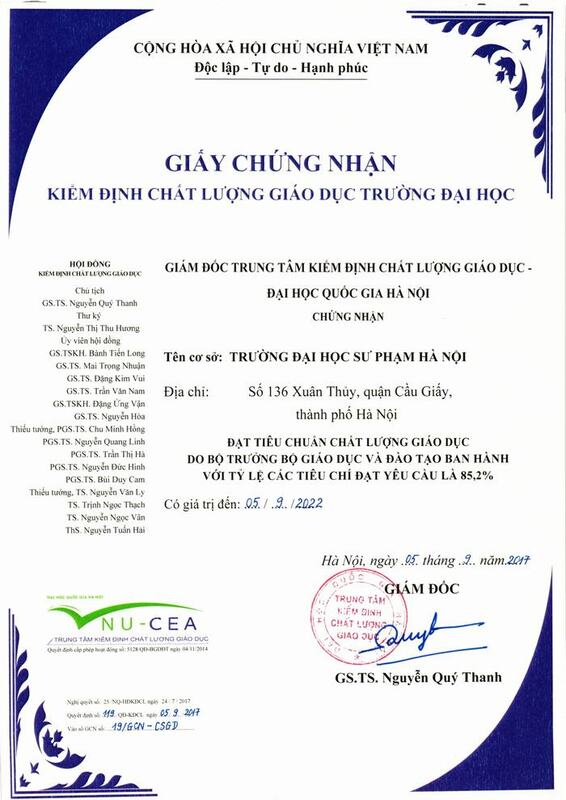 Accreditation of QUALITY ASSESSMENT STANDARDS of Hanoi National University of Education.